injection Moulded Pallets - manufacturer of Injection Moulded Pallets in India, No wonder we provide the largest range of Injection Moulded Pallets for diverse industry applications. 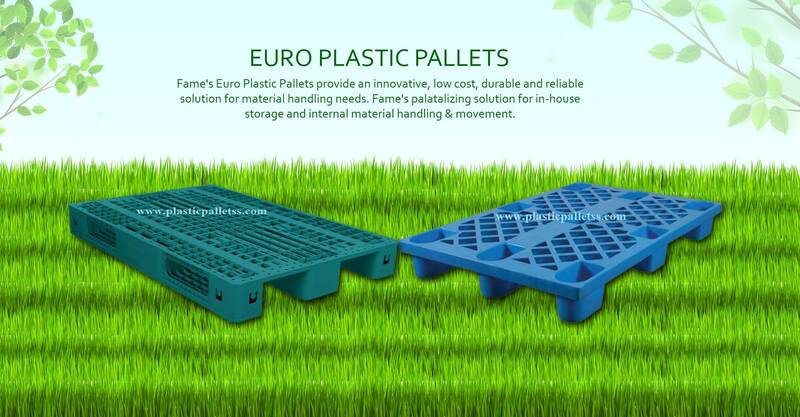 fame Injection Moulded Pallets offer : Economy, Durability, Compliance with world standards (HACCP, GMP, ISO 14000, 9000), Washable and insect proof, Automation with Forklifts, Stackers, Hand Pallets as well as Auto retrieval pallet systems, maintenance free, recyclable with committed quality standards, you trusted for decades. molded products like plastic pallets and material handling pallets for Cable, Pharmaceutical, Defence, Automotive, Railways, Packaging, Water treatment, pollution control & chemical industry. It has built a global reputation by providing its client’s with customised compounds & products to meet the challenging needs of the industry. Our range of Export pallets and Cargo Pallets is designed to meet the demands of one-way/export shipping for international and domestic commerce. The lightweight pallets reduce shipping costs, support heavy loads and reduce in-transit product damage. Made of durable polymers, our range of Export Cargo Pallets comply with International quality and safety standards and are resistant to infestation and the absorption of contaminants. We are manufacturer and exporter of Reversible Pallets which are available in various sizes and have great load bearing capacity. Four Way Entry Pallets offered by us is recommended for pharma, food processing, dairy, confectionery, hospitals, retail chains, hotels etc.